Changing shoes to suit the occasion need not be a complicated affair. Nor is it necessary to sacrifice function when choosing a heel height adjustable foot. Elation is easily adjusted up to 2 inches at the touch of a button, while the foot’s progressive stiffening feature adapts automatically to the load applied, ensuring a comfortable, steady gait. Heel height adjustability at the touch of a button. Lots of people (ok, mainly women) love their shoes. But swapping heel heights throughout the day can pose a problem because of the way the foot is lined up with the socket (alignment). The simple answer is Elation – alignment-friendly, heel height adjustability at the touch of a button. Whether it's boots, golf shoes, running shoes, sandals or dressy heels - enjoy the freedom to change shoes quickly and easily. Touch the height adjustment button for changes between 0 – 2" / 5cm, and the correct alignment of the prosthesis is maintained. The ankle can also be repositioned in a similar way to accommodate up or downhill slopes, changing back for level ground. Importantly, Elation's heel-height adjustability is incorporated in the energy-storing Flex-Foot design, so there is no need to compromise on function. The foot comes with an attractive cosmetic covering that features a realistic "sandal toe". Those who enjoy wearing a variety of footwear. Those who want to be able to swap shoes quickly and easily. People who weigh up to 220lbs / 100kg. *Elation is not suitable for high impact activities. Elation is easily adjusted between 0 and 2" / 5cm. The contour of the keel blade has been specially designed to accommodate regular changes within this range. The lightweight keel is made using the patented Flex-Foot carbon fiber technology for energy efficiency and flexibility. Its carefully designed contour ensures a smooth roll-over as the user steps forward. Available in sizes 22-28cm and with a choice of brown or beige foot covers. 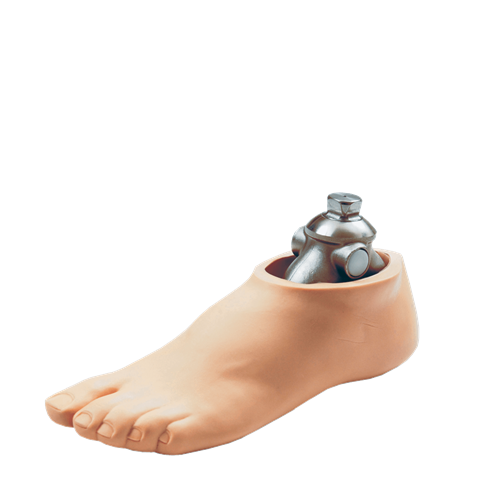 If you think Elation could be the perfect foot for you, discuss it as an option with your prosthetist.